The main goal of Slate is to provide “unrestricted global entertainment access” by using the blockchain technology powered by a cryptographically secure network. Slate is an entertainment utility protocol which will launch its own cryptocurrency soon. The company intends to offer a decentralized platform for people who want videos with low costs, high speed and high definition while it also helps in live event ticketing. By using the Slate protocol, creators, distributors, and producers will have a fair and transparent compensation for their services. Also, the tickets bought directly from the company will have more protection against fraud because the blockchain protects the ticket against forgery, as they have their properties stored on the blockchain. The Slate platform has four primary goals: to provide people with options for streaming, tickets, analytics and to decentralize entertainment. The content on demand will allow people to optimize what they want to watch and only pay for what they consume. The tokenization of tickets can make the tickets cheaper and easier to access, while they will also become more secure than they are at the moment because they will be more resistant to forgery. This two things will be done on the Binge and Slatix platforms, that we will talk more about later. By using the blockchain technology, Slate will also be able to store and analyze more data about how people watch the videos, which can be very valuable to companies who are willing to pay for this kind of information so they can make better products. 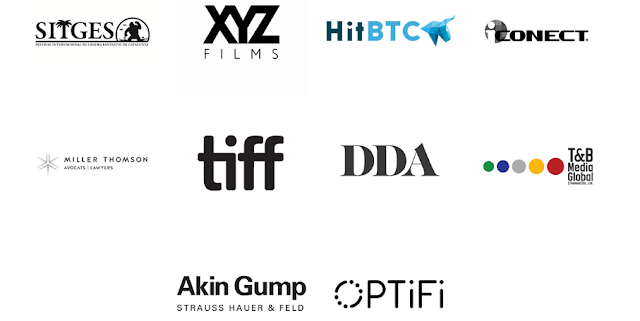 Finally, in a move to decentralize entertainment, the company plans to offer services to all the countries in the world without any type of restrictions based on their laws and giving them good content. The service will have many layers and it will consist of a master node network that will exist around the whole world. Binge is a Blockchain Video on Demand (BVOD) and it will be a premium decentralized streaming platform. It will facilitate streaming from any media with transparent analytics that will help companies to understand the behavior of their clients better. The platform will provide real-time revenue sharing between all the involved in the process of creating the videos that will be streamed on the platform. Slatix will be a marketplace to buy tickets for movies, concerts, shows, museums, sports events, etc, that will be powered by the Slate network. You can also use for entertainment discovery when you are bored and you need to find something new to do to pass the time. 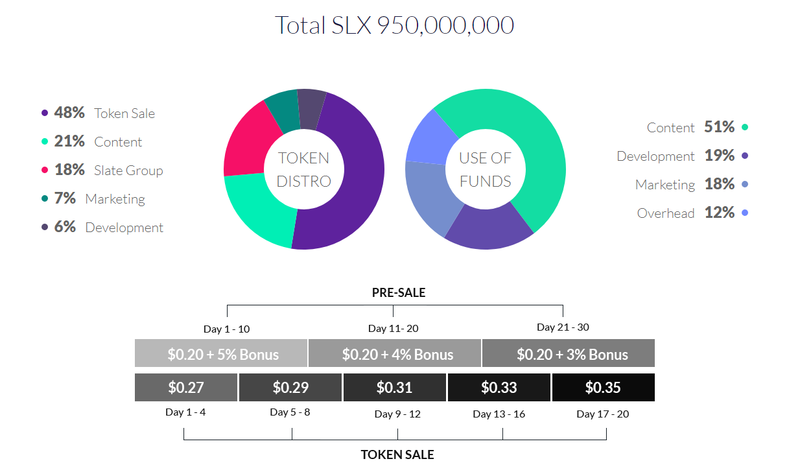 The users who are really interested in using this token can even enjoy loyalty rewards in the form of SLX tokens and other types of benefit. Also, they can get good discounts by buying tickets using this platform instead of other ones. Slate is selling SLX tokens to finance the content that will be on the platform. A total of 950,000,000 SLX tokens will be issued and 48% will be sold in the ICO. To participate, you have to register first. The pre-sale will last 15 days and each SLX token will cost $0.20, but will have a bonus that will vary from 5% to 3%. In the main sale, which will last 20 days, the price will go from $0.27 USD per token to $0.35 USD per SLX token. The board of directors of Slate is made of Michael Moyal, Marino Kulas and Cody Hackman. The technical team has Jason Squire, Gediminas Ausra, Robert Morton, Kal Gabriel, Ian Campbell and Jose Maradiaga. The management team is composed of Nate Bolotin, Jessica Labi, Jon Karas, Carrie Wolfe, Tyuhei Kitamura, Kevin Shea and Glenn Wong. It looks like Slate has a fair chance in the market. The company has an ambitious goal to dominate the streaming market and it will certainly face competitors like Netflix, but it definitely has a shot at success. While it will certainly be a hard journey, the team behind the company looks talented and their business goals are clear and focused, which is always positive.